In the beginning of December I wanted to make some updates to this website but I couldn't do so as Virgin Media who host this website did something to the server - so it was impossible for me to upload or change any files - an absolutely frustrating situation and very poor customer service as anyone having dealt with their telephone support can vouch. Now finally they fixed it. A quick summary of additions to the website: a 300 dpi scan of the GCE controller overlays back and front has been added to the [Documents]->Articles section. Alternatively you can just click here; More dead web links removed - Vectrex websites seem to be dropping like flies these days! There's more to tell, but I'll do that in the beginning of new year. Argh!, this isn’t Vectrex - what’s this? I hear you say. Yes folks the truth is out, I wasn't always VectrexMad!. Whilst I like to try to keep everything pure and Vectrex on this website, I recently came across a photo of my old ZX81 setup and not having the will or the resources to have yet another website, I have decided to host and put a link here to a page relating to the computer of my youth. In fact were it not for the ZX81 giving me an interest in computer technology I doubt if I would be such a Vectrex geek today. I've received more pictures of the AutoFire dongle box from nonner242 (for more details see Monday 5th news update). Please note that if you order a VectrexMad! Productions AutoFire dongle it doesn't come with this box (currently the dongle is simply supplied in a Jiffy bag). A new link has been added to a web site which contains a list of Vectrex serial numbers from around the world. You can either go to the [Links] tab and select the Miscellaneous option on this web site or just go to the site from here. I encourage you all to register your Vectrex serial numbers - new entries are shown at the end of the list. With enough entries it should be possible to make some conclusions about the number of Vectrex consoles sold and what the different letters in the serial numbers actually mean. I don't know how long this serial number web site has been present but I'm making regular copies of this web site just in case it suddenly goes offline). Firstly I have been cleaning up some of the dead outbound links on this web site. It’s a real shame that web sites disappear because each site can contain valuable snippets of information concerning the Vectrex. On a different note, interest in the AutoFire dongle product has been very positive. So much so that I am now considering to make a second batch of dongles. The editor of Video Game Trader (VGT) has even interviewed me regarding the AutoFire dongle but I am not sure if/when/where this will get published. 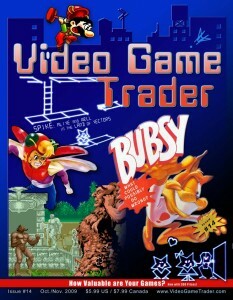 Finally my article on the Vectrex game character Spike is published in this month’s printed version of VGT. I am looking forward to seeing this finally in print (I began writing this last year!) as a lot of effort went into writing it. I believe (although there is no guarantee) various articles in the magazine including the one on Spike will eventually be made viewable on online. Unfortunately due to lack of time these last months, progress on my Vectrex game has been zero - so its still at the 60% complete stage :( Also regarding progress there is nothing new to mention about the overlay project other than it is still going. Peteski is busy with the artwork. For the latest status on this it's always best to check on the Yahoo based group Vectrex Overlay blog. 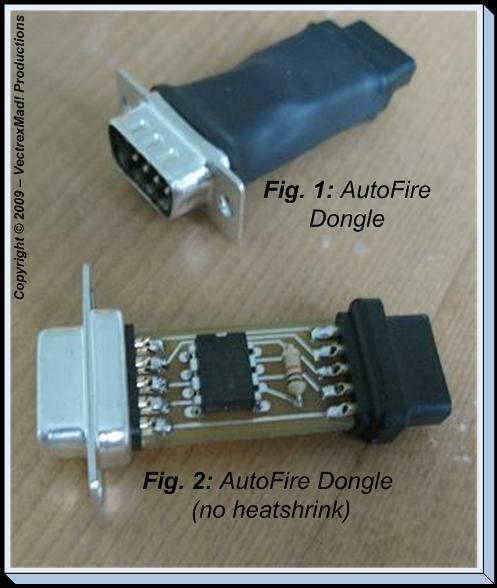 Now taking orders for the AutoFire dongle! The price is £11.99 plus postage and packaging. Visit the shop for more information regarding price and shipping. If you want to make an order send an email to sales@vectrex.co.uk (Send Email). Please state your address and preferred method of payment and I will get back to you. If you want to pay by paypal I will send you a different email address. If you are based in Europe and want to transfer money via my IBAN/BIC account please contact me for my IBAN number and BIC code. Those in the UK can also pay by cheque. Please contact me first to get a confirmation before sending any money. Instructions (v1.3) for the VectrexMad! AutoFire: Click here. Just to say that the PCBs and all the components have arrived, and soldering can now begin in earnest and real soon. I've already built a couple of AutoFire dongles using the new components and I am glad to say that they work as well as the original prototype. Since, this is not a proper mass manufactured product where economies of scale can help spread the cost of fancy product casing, only shrink wrap sleeving (see figure 1) will be used to protect/cover the components on each dongle. It's not as professional looking as using a custom plastic case but it certainly keeps the bill of materials down. Soon I'll make a YouTube video and will then contact all those on the "interested" list. I will reserve any orders received via the "interested" list first before going public. Recently the finger I use for pushing the fire button on my Vectrex controller has been hurting. Whether this is due to an unhealthy obsession with playing Vectrex games (highly probable) or just plain old age I don't know. However, it was an issue and I didn't want to have to put a cigarette box type warning message sticker on my Vectrex to remind me that playing games on the Vectrex was bad for my health! I therefore came up with a small circuit that allows auto/repetitive fire with a single button press. It’s an "inline" device that sits between the Vectrex console and controller plug - so there's no need to take apart the controller. The prototype is based on a PIC micro controller. 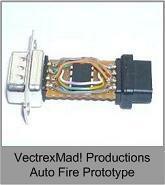 This means the Auto Fire device has been programmed to be "smart" e.g. 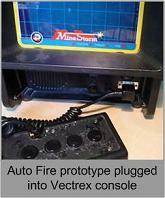 by pressing the fire button down during Vectrex power on, the device allows normal controller operation for games that don't like auto fire (e.g. Pole Position). The prototype works really well, not only is my finger hurting less, but I am also getting higher scores on old favourites like MineStorm and Vectrexians. I have decided to turn this into a "mass" production project so that other Vectrex players can also enjoy the experience. I've been in contact with Richard Hutchinson and he has kindly agreed to transcribe my circuit design into a PCB so I can get a professional PCB shop to manufacture the boards. After that I'll make around 25 fully populated and completed Auto Fire products for sale. I hope to sell the Auto Fire products for around 12 pounds plus postage. If anybody is interested to buy one please send me an email to sales@vectrex.co.uk (Send Email) to get added to the "interested to order" list. Once I have built them then I'll communicate with those in the list first. Kokovec, author of demo software Becky’s message, Koko’s Retribution, and designer of the Vectrex PS/2 Keyboard converter as well as other Vectrex related hardware, including his marvelous PS2 to Vectrex convertor - one of which he sold to me, has a new link to his web pages. I've updated the Hardware Links page on this web site. but you can also jump to his webpages from here: www.kokosplace.50webs.com . 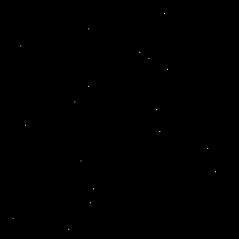 Click on the line images that look like flute players to drill down to Kokovec’s different Vectrex projects. The results are in! There were 36 responses in total. My thanks go to all who responded. This is the top eight: (1) Mine Storm, (2) Star Castle, (3) Protector, (4) Pole Position, (5) Yasi, (6) Armour Attack, (7) Dark Tower and (8) Fortress of Narzod. A link to the spreadsheet used in the analysis of the results is included here. Some interesting responses were received. One asked for a Scramble overlay with the original arcade artwork. Another asked for a generic green overlay to be used to replace ones that aren't already owned rather than having just a b&w screen. Others expressed that they would want to buy whole sets of overlays if the price was right. New overlays for homebrews which don't already have them were also requested:- the game YASI being the most popular of the requests. The results will now be presented to the enthusiasts at the newsgroup rec.games.vectrex to determine the way forward for producing the overlays. Monday 1st June 2009 - Scan of news snippet from 1982 - "Milton Bradley Acquires G.C.E"
I just added, under the [Documents] tab in the Magazine Scans section, a scan of a news snippet titled "Milton Bradley Acquires G.C.E." as printed in Arcade Express. Arcade Express was a bi-weekly newsletter which was a published by Reese Publishing Co. Inc. in the 80s. (1)	Please respond with up to four to eight Vectrex game names for overlays you would most like to see reproduced (overlay suggestions can be for either original or homebrew games). For more than one overlay wish please put your choices starting with the most wanted first. This survey will close on the 6th day of June. Until last week my only hardware project for the Vectrex had been to solder a single wire from Richard H's VecDev product to the "reset" contact on the logic circuit board in my Vectrex. Some might argue that it’s a huge overstatement, to call soldering a single wire to a PCB a hardware project. Well at least with my latest activities I can claim to have done a proper hardware project. Granted, the level of sophistication is still on the simpler side (compared to some home brewers) but nevertheless I am really pleased with the final outcome. What am I talking about? - I am talking about a pimped up VecVox that I recently built. VecVox is a homebrew speech synthesizer that plugs in the second joystick port of the Vectrex. It's not new, it's predecessor called VecVoice was available sometime in 2002. Then VecVox came about in 2004 because the sound chip (SPO256 ) used in VecVoice had become obsolete. VecVox uses a newer chip (SpeakJet) which is still commercially available. VecVox has two modes, a mode to emulate the VecVoice (a microchip in the VecVox circuit maps the original SPO256 control codes to the newer chip), and a mode which offers the functionality of the newer sound chip including greater control of speech as well as sound effects. The only thing I didn't bring out from the VecVox PCB to the cabinet enclosure was the volume control. I figured that since at low volume the VecVox would be competing with the normal buzz of the Vectrex sound, why bother having a volume selection and instead just adjust the existing VecVox PCB potentiometer to give a permanent maximum volume to drown out the buzz. The red pushbutton on the top of the speaker cabinet is connected to the pushbutton on the VecVox circuit. Momentarily pushing down the button during power up of the Vectrex makes the VecVox behave as a VecVoice. As you can see from the photos and video the final result is quite pleasing. The style of the speaker really does fit in with the Vectrex styling. I can't help but feel that the look of my mash up might not be too far off from the look of a commercially produced product had VecVox been around in the heyday of the Vectrex. 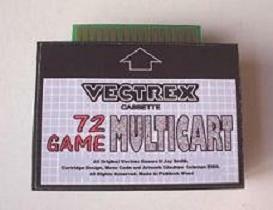 Thursday 16th April - Andy Coleman's 72 Game Multicart back in stock !!! Andy Coleman's "72 Game Multicart" is back in stock. You can see from my review in Video Game Trader Issue 6 (pages 11 & 12) last year that I was quite impressed with this multicart. I've also got a Sean Kelly multicard, but I find selecting a game much easier with the "72 Game Multicart". Other advantages over the Sean Kelly multicart are that The "72 Game Multicart" has more programs than the Sean Kelly card plus also includes Andy's City Bomber and Hangman games. There's now also a "lite" version of the mulitcart selling at a reduced price that does not include the cartridge shell. Standard cartridge shells can be purchased from John Dondzila (www.classicgamecreations.com) - or if on a budget simply reuse a shell from an old MB/GCE game. For the "lite" version a standard sized sticker is included that can be attached to the donor cartridge. 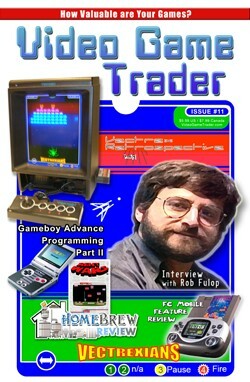 Visit www.playntradeonline.com/vectrex/ to find out more or simply click on the image to the left. There's a new kid on the block! Oliver from Berlin has launched a brand new website titled Vectrex Museum. It has information nicely presented about the history of the Vectrex. If you drill down into the links you'll also find lots of other interesting information. Click on the image to the right to jump directly to the website (www.vectrexmuseum.com). With the new Star Trek film expected in Theatres in May 2009, Star Trek is back in vogue (some might say its always been in vogue). I recently found an old magazine article briefly covering the original Star Trek game for the Vectrex. A new section has been added under the [Documents] tab called [Magazine Scans] on this web site. In the future I will include other relevant information scanned from magazines under this section too. VGT have done a really good job for the cover of their March issue (#11). They've adopted a mock Vectrex overlay look. The cover is for a featured article which is a Vectrex Retrospective: "A look at the past and the future of this popular classic system". The magazine is available in paper copy by subscription (click on the image below to see subscription rates) or for a one off fee. Or if you wait till April/May it will be available online to view for free. Vectrexians homebrew author Kristof always said that if there was demand he would make another batch of Vectrexian cartridges available. Well having successfully sold all 150 previous copies, Kristof has anounced on his website that he has created another 150 game batch! So if you didn't manage to get a copy the first time round you have another chance to enjoy this game and appreciate the quality of the colour overlay and how it contributes to the game. He also has a new website address: www.kristofsnewvectrexgames.comli.com. For those who don't know about Vectrexians, where have you been? - See my review in VGT Issue 6, starting page 13. Yes, I am still here despite missing nearly two months of news updates. At the end of last year I got a VecVox on eBay and have been playing with it ever since. After contacting VecVox/Voice designer Richard H, I learnt something new. VecVoice was the original Vectrex speech solution which used the SPO256 speech chip. When that chip became obsolete, Richard produced VecVox which used an altogether more advanced chip known as the SpeakJet. For backwards compatibility VecVox does emulate the VecVoice - the user has to press a push button to get VecVoice mode. This is interesting for homebrewers, because if they are considering writing new games they should only consider to use the native VecVox (SpeakJet) mode. Games that specifically support the VecVoice are Verserk and YASI. Games that support VecVox are Space Frenzy, Spike's Circus, Debris, Colour Clash and Vectoblox. Of course because of its backwards compatibilty VecVox is able to support the VecVoice games too.